Connect your 2Checkout account to our Pay-Per-View system as a Payment Gateway and start using it as your payment processor to accept your client's Credit Card and Debit Card payments. If you want to check out some Pay-Per-View Demos and extra information please visit our Pay-Per-View information page. To enable your 2Checkout as Pay-Per-View Gateway you will need to go to the ⚙️ Settings tab. Click on the 2Checkout Gateway in the center column. This will open the 2Checkout Setup Panel on the right. Here you can change the default name from 2Checkout to something else if desired. Secret Word: Here you will need to enter your 2Checkout Secret Word. See detailed setup information below. SID: Here you will need to enter your 2Checkout Account Number. See detailed setup information below. Now we simply click on the green ✔ Save button to save your 2Chekout Payment Gateway. To find your 2CO Secret Word go to 2Checkout.com and Log In to your account. Here you need to go to: Account > Site Management. Under Site Management scroll down where you will see the "Secret Word" section. 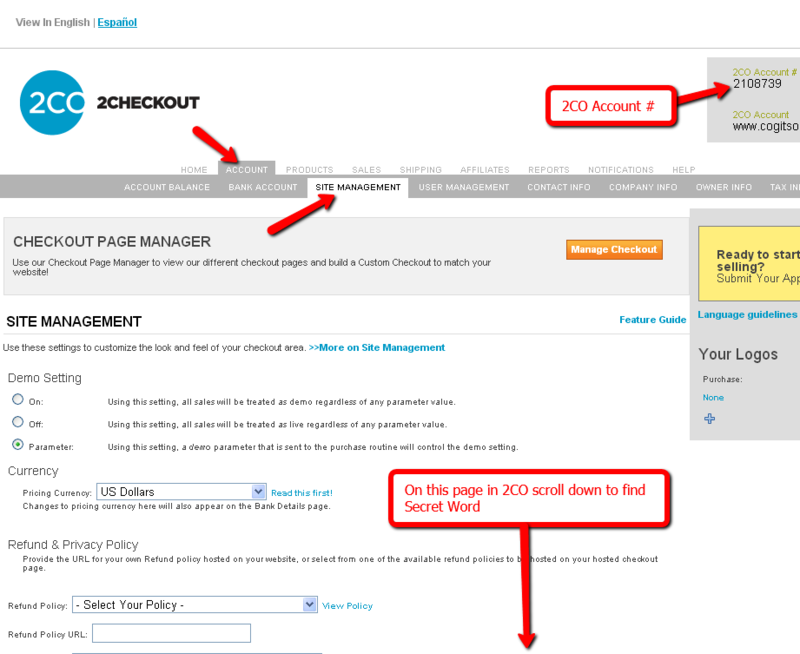 Copy your secret word from the 2Checkout panel and paste it into the Secret Word entry box within the 2Checkout Payment Gateway setup. To find your 2CO Account Number go to www.2Checkout.com and Log In to your account. Copy your account number from the 2Checkout panel and paste it into the SID entry box within the 2Checkout Payment Gateway setup. You will need to Setup your 2Chekout Approved URL in your 2Chekout account. This controls that when the client makes a payment the confirmation is sent back to our system to be able to give access to the viewer to their purchased video or playlist. Scroll down and locate the Approved URL section. Click on the orange Save Changes button. Once the Approved URL has been set up click on the ☑️ I confirm I have completed the required setup tick box.